All around the world young people are getting a bad deal: we don’t have control of our jobs, homes, technology, data or education — because we don’t own them. Cooperatives are a way to own and manage enterprises democratically. If we come together as a generation we can create a cooperative economy that works for everyone, not just the 1%. Today we are launching the campaign WE OWN IT! for youth cooperative entrepreneurship and its dedicated website. Designed by CICOPA together with the worker cooperative Alt Gen, WE OWN IT! 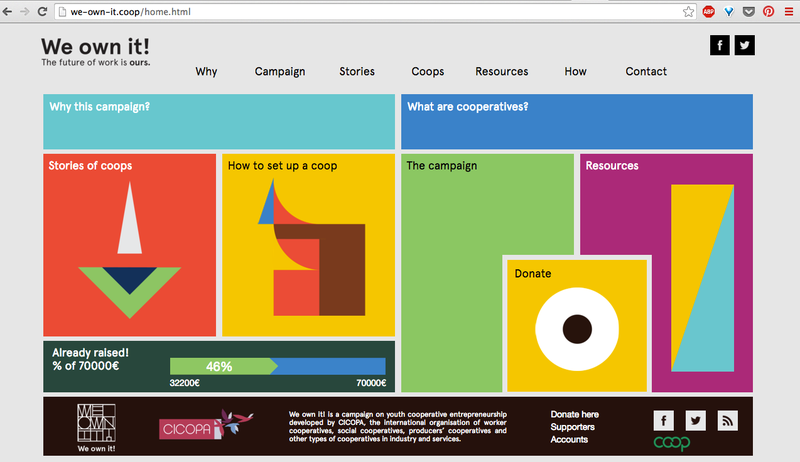 is here to spread stories about cooperatives and cooperators to young people around the world. We want to inspire the next generation to create more caring, cooperative jobs and an economy run by and for people with equality, solidarity and sustainability at its heart. Stay tuned! A new story of young cooperators will be uploaded each month and a study on youth cooperative entrepreneurship including the trends among young people in establishing and being part of worker, social and producers’ cooperatives around the world will be published by CICOPA!